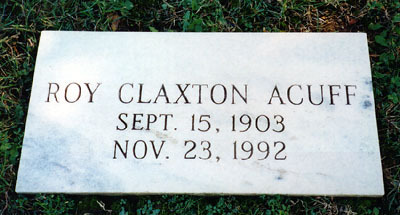 Roy Acuff was born in Maynardville, Tennessee to Ida (née Carr) and Simon E. Neill Acuff, the third of five children. The Acuffs were a fairly prominent Union County family. Roy’s paternal grandfather, Coram Acuff, had been a Tennessee state senator, and Roy’s maternal grandfather was a local physician. Roy’s father was an accomplished fiddler and a Baptist preacher, his mother was proficient on the piano, and during Roy’s early years the Acuff house was a popular place for local gatherings. At such gatherings, Roy would often amuse people by balancing farm tools on his chin. He also learned to play harmonica and jaw harp at a young age. 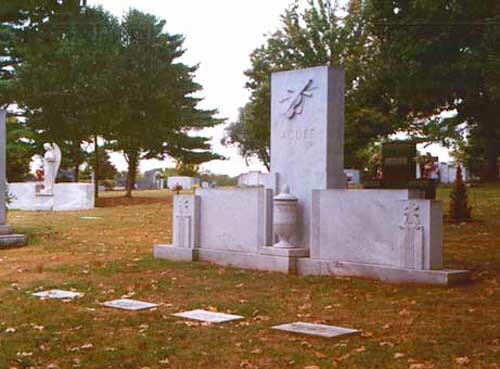 In 1919, the Acuff family relocated to Fountain City (now a suburb of Knoxville), a few miles south of Maynardville. Roy attended Central High School, where he sang in the school chapel’s choir and performed in “every play they had.” Roy’s primary passion, however, was athletics. He was a three-sport standout at Central, and after graduating in 1925, he was offered a scholarship to Carson-Newman, but turned it down. He played with several small baseball clubs around Knoxville, worked at odd jobs, and occasionally boxed. In 1929, Acuff tried out for the Knoxville Smokies, a minor-league baseball team then affiliated with the New York (now San Francisco) Giants. A series of collapses in spring training following a sunstroke, however, ended his baseball career prematurely. The effects left him ill for several years, and he even suffered a nervous breakdown in 1930. “I couldn’t stand any sunshine at all,” he later recalled. 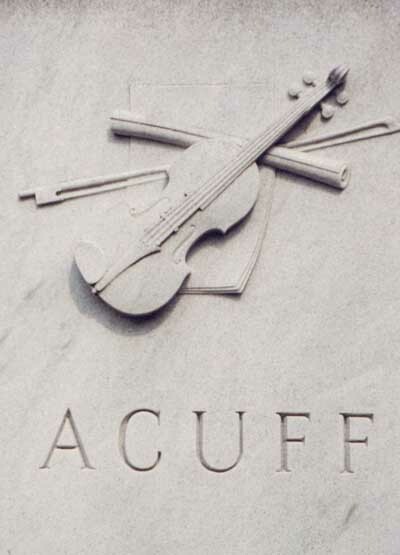 While recovering, Acuff began to hone his fiddle skills, often playing on the family’s front porch in late afternoons after the sun went down. 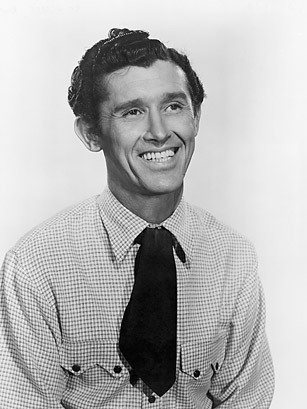 His father gave him several records of regionally-renowned fiddlers, such as Fiddlin’ John Carson and Gid Tanner, which were important influences on his early style. In 1932, Dr. Hauer’s medicine show, which toured the Southern Appalachian region, hired Acuff as one of its entertainers. The purpose of the entertainers was to draw a large crowd to whom Hauer could sell medicines (of suspect quality) for various ailments. While on the medicine show circuit, Acuff met legendary Appalachian banjoist Clarence Ashley, from whom he learned “The House of the Rising Sun” and “Greenback Dollar”, both of which Acuff later recorded. As the medicine show lacked microphones, Acuff learned to sing loud enough to be heard above the din, a skill that would later help him stand out on early radio broadcasts. In 1934, Acuff left the medicine show circuit and began playing at local shows with various musicians in the Knoxville area. That year, guitarist Jess Easterday and Hawaiian guitarist Clell Summey joined Acuff to form the Tennessee Crackerjacks, which performed regularly on Knoxville radio stations WROL and WNOX (the band moved back and forth between stations as Acuff bickered with their managers over pay). Within a year, the group had added bassist Red Jones and changed its name to the Crazy Tennesseans after being introduced as such by WROL announcer Alan Stout. Fans often remarked to Acuff how “clear” his voice was coming through over the radio, important in an era when singers were often drowned out by string band cacophony. The popularity of Acuff’s rendering of the song “The Great Speckled Bird” helped the group land a contract with the ARC, for whom they recorded several dozen tracks (including the band’s best-known track, “Wabash Cannonball”) in 1936. Needing to complete a 20-song commitment, the band recorded two ribald tunes—including “When Lulu’s Gone”—but released them under the pseudonym of “the Bang Boys”. The group split from ARC in 1937 over a separate contract dispute. In 1938, the Crazy Tennesseans moved to Nashville to audition for the Grand Ole Opry. Although their first audition went poorly, the band’s second audition impressed Opry founder George D. Hay and producer Harry Stone, and they offered the group a contract later that year. On Hay and Stone’s suggestion, Acuff changed the group’s name to the “Smoky Mountain Boys,” referring to the mountains near where Acuff and his bandmates grew up. Shortly after the band joined the Opry, Clell Summey left the group, and was replaced by dobro player Beecher (Pete) Kirby—best known by his stage name Bashful Brother Oswald—whom Acuff had met in a Knoxville bakery earlier that year. Acuff’s powerful lead vocals and Kirby’s dobro playing and high-pitched backing vocals gave the band its distinctive sound. By 1939, Jess Easterday had switched to bass to replace Red Jones, and Acuff had added guitarist Lonnie “Pap” Wilson and banjoist Rachel Veach to fill out the band’s line-up. Within a year, Roy Acuff and the Smoky Mountain Boys rivaled long-time Opry banjoist Uncle Dave Macon as the troupe’s most popular act. In spring 1940, Acuff and his band traveled to Hollywood, where they appeared with Hay and Macon in the motion picture, Grand Ole Opry. Acuff appeared in several subsequent B-movies, including O, My Darling Clementine(1943), in which Acuff plays a singing sheriff, and Night Train to Memphis (1946), the title of which comes from a song Acuff recorded in 1940. Acuff and his band also joined Macon and other Opry acts at various tent shows held throughout the southeast in the early 1940s. The crowds at these shows were so large that roads leading into the venues were jammed with traffic for miles. Starting in 1939, Acuff hosted the Opry’s Prince Albert segment, but left the show in 1946 after a dispute with management. In 1942, Acuff and songwriter Fred Rose (1897–1954) formed Acuff-Rose Music. Acuff originally sought the company in order to publish his own music, but soon realized there was a high demand from other country artists, many of whom had been exploited by larger publishing firms. Due in large part to Rose’s ASCAP connections and gifted ability as a talent scout, Acuff-Rose quickly became the most important publishing company in country music. In 1946, the company signed Hank Williams, and in 1950 published their first major hit, Patti Page’s rendition of “Tennessee Waltz”. 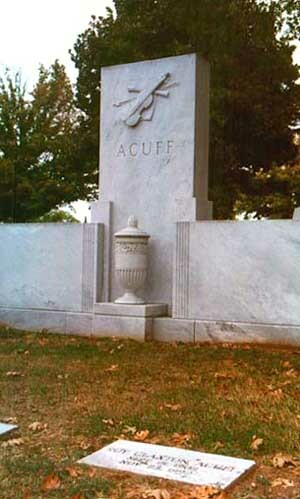 In 1943, Acuff was initiated into the East Nashville Freemasonic Lodge in Tennessee, to which he would remain a lifelong member. Later that same year, Acuff invited Tennessee Governor Prentice Cooper to be the guest of honor at a gala held to mark the nationwide premier of the Opry’s Prince Albert show. Cooper rejected the offer, however, and lambasted Acuff and his “disgraceful” music for making Tennessee the “hillbilly capital of the United States.” A Nashville journalist reported the governor’s comments to Acuff, and suggested Acuff run for governor himself. While Acuff initially did not take the suggestion seriously, he did accept the Republican Party nomination for governor in 1948. Acuff’s nomination caused great concern for E.H. Crump, the head of a Memphis Democratic Party political machine that had dominated Tennessee state politics for nearly a quarter-century. Crump was not worried so much about losing the governor’s office—in spite of Acuff’s name recognition—but did worry that Acuff would draw large crowds to Republican rallies and bolster other statewide candidates. While Acuff did relatively well and helped reinvigorate Tennessee’s Republicans, his opponent, Gordon Browning, still won with 67 percent of the vote. In 1972, Acuff’s career received a brief resurgence in the folk revival movement after he appeared on the Nitty Gritty Dirt Band album, Will the Circle Be Unbroken. The appearance paved the way for one of the defining moments of Acuff’s career, which came on the night of March 16, 1974, when the Opry officially moved from the Ryman Auditorium to the Grand Ole Opry House at Opryland. The first show at the new venue opened with a huge projection of a late-1930s image of Roy Acuff and the Smoky Mountain Boys onto a large screen above the stage. A recording from one of the band’s 1939 appearances was played over the sound system, with the iconic voice of George Hay introducing the band, followed by the band’s performance of “Wabash Cannonball”. That same night, Acuff showed President Richard Nixon, an honored guest at the event, how to yo-yo, and convinced the president to play several songs on the piano. In the early 1980s, after the death of his wife, Mildred, Acuff, then in his 80s, moved into a house on the Opryland grounds and continued performing on stage. He arrived early most days at the Opry and performed odd jobs, such as stocking soda in backstage refrigerators. In 1991, he was awarded the National Medal of Arts, and given a lifetime achievement award by the John F. Kennedy Center for the Performing Arts, the first Country music act to receive the esteemed honor. He died in Nashville on November 23, 1992 of congestive heart failure at the age of 89. Many of Acuff’s songs show a strong religious influence, most notably “Great Speckled Bird”, “The Prodigal Son” and “Lord, Build Me a Cabin”. Such songs were typically set to a traditional Anglo-Celtic melody, which is most apparent on “Great Speckled Bird” and the 1940 recording “The Precious Jewel”. Acuff performed popular songs of the day, including Pee Wee King’s “Tennessee Waltz” and Dorsey Dixon’s “I Didn’t Hear Nobody Pray”, the latter of which he appropriated and renamed “Wreck on the Highway”. He also recorded a version of Cajun fiddler Harry Choates’ “Jole Blon”. Traditional recordings included “Greenback Dollar”, which he probably learned from Clarence Ashley while on the medicine show circuit, and “Lonesome Old River Blues”, which he recorded with the Smoky Mountain Boys in the 1940s. Acuff and the Crazy Tennesseans recorded “Wabash Cannonball”—another traditional song—in 1936, although Acuff did not provide the vocals on this early recording. The better-known version of the song with Acuff providing the vocals was recorded in 1947. In 1979, Opryland opened the Roy Acuff Theatre, which was dedicated in Acuff’s honor (it was demolished in 2011). Dunbar Cave State Natural Area was established in 1973 from a recreational area the state had purchased from Mrs. McKay King. The cave was owned by Acuff from 1948 to 1963. Two museums have been named in Acuff’s honor—the Roy Acuff Museum at Opryland and the Roy Acuff Union Museum and Library in his hometown of Maynardville. Acuff has a star on the Hollywood Walk of Fame located at 1541 Vine Street. He is pictured with other Country singers at the new Smoky Mountain Opera in Pigeon Forge, Tennessee.